Looking to have your book or e-book edited before you self-publish? Bookfly Design offers copyediting and proofreading services for indie authors. At this time, we're no longer accepting new editing clients. If you've worked with us in the past and would like to schedule an edit, please contact us about our availability. A common complaint among readers of self-published books is poor editing. Let me correct your manuscript before you publish so readers can enjoy your story without distraction. Proofreading focuses on correcting mechanical errors. Compare the sample above with the copyedited page to see the difference between the services. Proofreading costs 0.5 cents per word, or $500 per 100,000 words. When proofreading, I focus on catching errors in grammar, spelling, punctuation, usage, and capitalization. I will fix typos and note glaring inconsistencies, but proofreading does not include stylistic edits. With this service, I provide an experienced set of eyes to help remove distracting errors before you publish. More comprehensive than proofreading, my copyediting services encompass making stylistic improvements as well as fixing mechanical errors. When copyediting, I correct errors, and I also make stylistic suggestions to improve word choice, clarity, and consistency. As a fiction writer, I understand the importance of maintaining the writer's voice. This line-editing service helps fine-tune your manuscript while staying true to your unique style. I use track changes, so you can review each edit and choose what to implement. I read a wide variety of books, and I am comfortable editing all genres of fiction as well as narrative nonfiction. 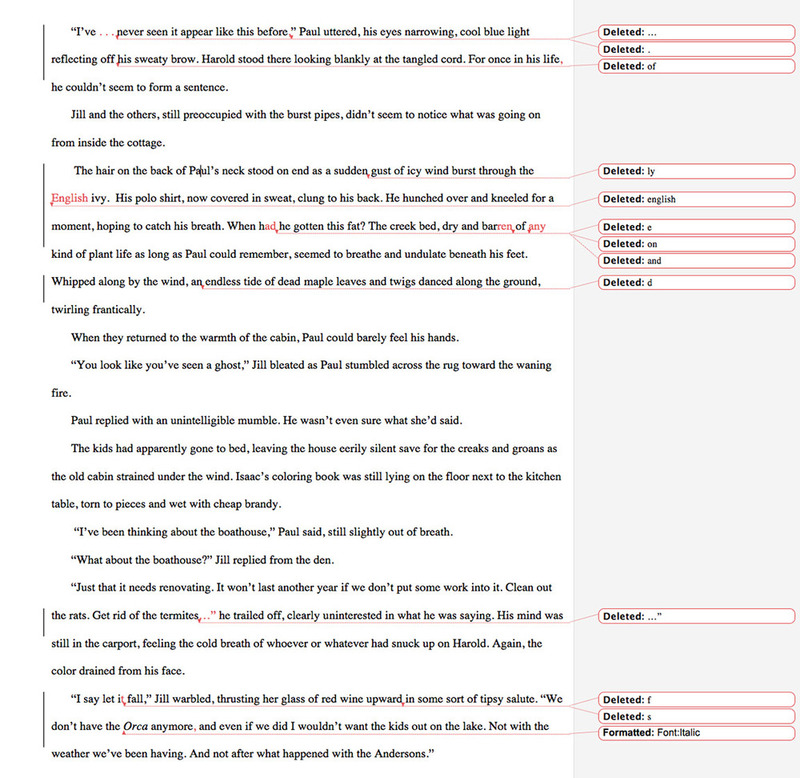 Request a sample edit of up to five pages from your book so you can decide if my style works for you. 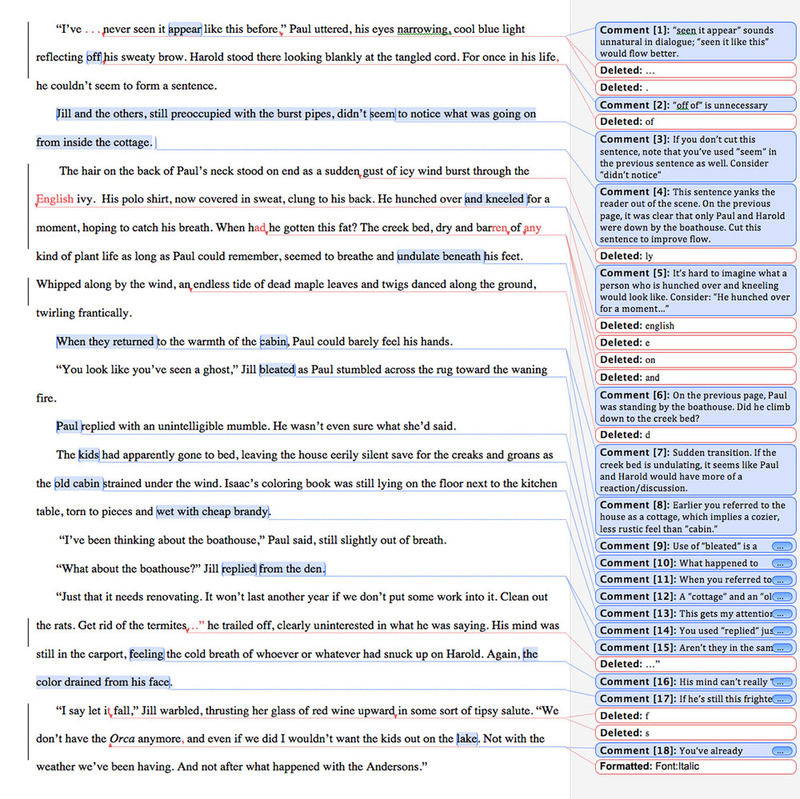 Unsure which level of editing is best for your book? Just ask! Contact us to schedule your edit. I require an initial deposit of half the total cost before work begins. Final payment is due upon completion of editing. Ready to schedule your edit, request a sample edit, or learn more about our editing services? Get in touch through the contact us page or e-mail me directly at editing [at] bookflydesign.com.